I suppose I let Once Upon A Time In The West go by in 1969 because it didn’t have Clint Eastwood. 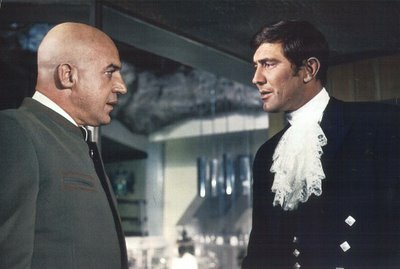 On Her Majesty’s Secret Service of the same year was also a pass because Sean Connery didn’t play Bond. What was I thinking? Now I consider both classics, and could kick myself for not having gone at a time when they would have had a far greater impact upon my youthful psyche. A lot of Eastwood followers may have stayed away from Once Upon A Time for the same reason I did --- Paramount only realized two million in domestic rentals. This was way down from the 6.0 United Artists captured for The Good, The Bad, and The Ugly a few years earlier (worldwide on that one was 18.4). Even A Fistful Of Dollars doubled Once Upon A Time’s domestic take with 4.2 million. Here’s Sergio Leone directing Claudia Cardinale as to the proper use of firearms. On Her Majesty’s Secret Service was a disappointment for United Artists. The loss of Sean Connery was really felt at the ticket windows. It’s now my favorite in the whole series, but where was I in 1969 when UA really needed me? Majesty’s took 9.1 million in domestic rentals, plus 15.7 foreign. Final profit was 7.3 million. The previous You Only Live Twice, itself a letdown after Thunderball, was good for 19.3 domestic, while 1971’s Diamonds Are Forever racked up 19.7 domestic and 27.7 foreign. Profits for that one were 16.6. It would be the late eighties before I’d see Majesty’s for the first time, and that was a 16mm scope print shown by a collector friend of mine (hey, Steven, where you been?). Can’t wait for Sony to get this one out in high-definition. I'm not sure if Sony's HD would save the once-brilliant visuals of On Her Majesty's Secret Service. Filming in the Swiss Alps, Peter Hunt used various filters to subdue or block out glare. The end result were colors I'd never seen before: intense orange sunsets, navy-blue nights and vivid indigo skies during those astonishing ski chases. You can still see those colors on the pan-and-scan VHS editions issued by CBS/Fox in the early 1980s — tapes that have undoubtedly deteriorated from age, diminishing the values of those colors. When UA/MGM remastered the Bond films for letterbox VHS in the late 80s, the colors of On Her Majesty's Secret Service were toned down, neutralized to appear more "real." They flattened it out, perhaps irretrievably so. It stands as one of the best films in the series (my personal favorite is still Goldfinger), but the look it once had is gone, and I doubt anyone working on HD has a clue about (or cares about) those original, magical hues. According to the IMDb, "On Her Majesty's Secret Service" had a budget of $7 million but made $87 million worldwide. Maybe that was a disappointment for the Bond people, but it seems like a pretty healthy profit margin to me! I looked at imdb's figures on the Bond films, and a lot of their information is suspect. Total worldwide rentals for OHMSS were 24.8 million. I don't think there's much way the picture could have achieved an overrall gross of 87 million, so I'm standing by my numbers, which came from a very reliable UA source. in "Once Upon A Time.."? I happened to see it quite recently and thought it superb. I also think your blog is outstanding! I, too, discovered both films after the fact. Unlike you, however, I was not THAT impressed with them. Certain sections of ONCE UPON A TIME...are amazing (including the train station sequence from which your Jack Elam/Woody Strode scene comes)but as a whole it doesn't hold together for me. Same with Bond. I love Telly but I feel he's miscast. I love Diana Rigg but her natural "M appeal" doesn't grab me in this. Lazenby and the ski sequences are the best thing about it to me. John, I'm with you on these two - plus they both have such outstanding opening sequences. Very interested to read what "flickhead" had to say about the colours - I've always thought it looked like a late 60s Steranko Marvel Comic and it'd be glorious to see an original print. I used to avoid "On Her Majesty's Secret Service" for years, because it didn't feature Roger Moore or Sean Connery. ABC's broadcast of the movie in 1976 was a disaster. Then I saw the movie on VHS back in the late 80s and fell in love with the movie. It is now my favorite Bond movie of all time. The recent "Casino Royale" comes in a close second.